You may have heard from a friend or doctor that compression stockings will help you with varicose veins. Well, they would be right. Doctors and other medical practitioners recommend and prescribe compression stockings as one of the best ways to passively relieve pain and soreness. Compression not only helps with varicose veins but other symptoms such as deep vein thrombosis (DVT) and lymphoedema. But the most common one is varicose veins. How Compression Stockings Benefit YOU. Varicose veins are swollen and enlarged veins. The reason these are bad is that these bulges will make it harder for blood to circulate throughout your legs and body. In more extreme situations, the vein may rupture. This danger is why it is so important to know your symptoms and consult with your doctor to see if compression stockings and other treatments are right for you. You can see these commonly in the leg and thigh region. Another term for smaller cases is “spider veins” which are essentially the same thing. Except they occur on a small scale with web-like features. As I’ve said before: compression stockings are items that doctors prescribe to help deal with this kind of swelling and soreness. The compression aspect is designed to compress, or apply direct pressure, to your leg and thigh region which will push the blood under the skin to move and circulate. Compression will promote blood flow which will help reduce the pain and discomfort. But don’t expect them to heal overnight. Depending on the severity of your varicose, it will take time. The cool thing about compression apparel is that it provides passive benefits from just wearing them. 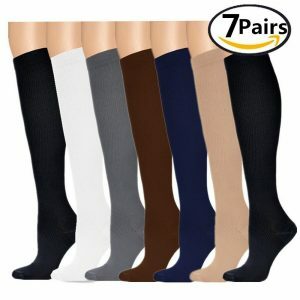 Compression stockings have a sleek and attractive designed that can looks good with many outfits. This form and functionality give you a piece of clothing that combines both. All you have to is put them on and wear them throughout the day. If you’re not prescribed and recommended stockings directly from your doctor or medical professional, then it becomes much more important to know how to pick the best compression stockings for you. The amount of graduated compression you require in your stocking. For the uninitiated, the graduated compression in a sock determines how much pressure, or compression, will apply when your wear the stocking. It is important you try to get in the ideal range for you. If the swelling and pain come with the bulging veins, a compression stocking in the 25-30+ mmHg range is ideal, for these moderate to extreme cases. If the varicose veins are smaller in size, check out mild to moderate levels of compression stockings in the 10-25 mmHg range. How often and when will you be wearing compression stockings? Will you be wearing these stockings during the workday, during exercise, or while you sleep? If so, you’re going to need a lot of socks. I know compression stockings can become expensive when buying them initially, but trust me they are an investment. If it’s currently not in your budget or you want to try them out, try buying bulk packs of compression stocks. Read our list for best compression stockings for varicose veins below to get an idea of what you want in a compression stocking. These compression socks/stocking combo hit that sweet spot that is right in the middle concerning graduated compression. If you don’t know if your symptoms are too mild or too severe, I would recommend starting with this stockings to gauge the effectiveness of their wear with varicose veins. This graduated compression should be perfect to deal with most cases of DVT and lymphoedema as well. You want socks that are comfortable. 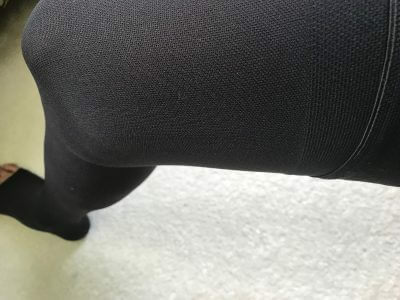 These compression stocking’s comfortable weave knit design is ideal for long-term passive wear. It has a sleek, latex free design with comfortable nylon material which gives added benefits. Also, they’re unisex stockings, making them perfect for both men and women to wear when they’re on-the-go. I would highly recommend these compression stockings if you need a trusted brand to help you with your symptoms of varicose veins. To combat symptoms of varicose veins, you will need a medical-grade compression stocking that is comfortable to wear, won’t slip off, and provides a healthy level of compression. With that in mind: I recommend getting these thigh high compression stockings by LemonHero. I had the chance to try them out recently and was impressed by the snug and secure fitting of the stocking. After further investigation, I saw the attention to detail the manufacturer implemented into the overall design. The elastic band features silicone ribbing that provides secure wear for long periods of time. As for the open-toe design, it provides the needed air circulation for comfortable wear when lounging around. The 20-30mmHg graduated compression is strong enough to help alleviate some of the symptoms of soreness and pain that come with varicose veins, or spider veins. And since it is a thigh high stocking, the compression coverage spans the length of most of the leg. If you want a thigh high sock that provides compression to most of your leg, I highly recommend getting the LemonHero Compression Stockings to wear for varicose veins. 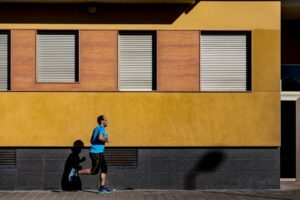 These compression socks are perfect for individuals are who on a budget or want to test out if compression stockings are right for them. They come in a middle-ground 15-20 mmHg graduated compression which is suitable for most people with smaller varicose veins and spider veins. They are bang-for-your-buck. You’re getting seven pairs of compression socks for a relatively low price. And you’re not getting low-quality socks. These are well-made and should last you a while. The best things about having several stockings at once are that it will let you cycle through them more often. The come in a minimalistic, sleek design with several color choices and options of your choosing. If you don’t have the money right now for the more expensive options, these are a great choice to act as a temporary solution to deal with varicose veins symptoms. We chose these compression socks because of their unique, footless design. Some people will have personal preferences when it comes to stockings, and these cater to those individuals. If you don’t necessarily need the full compression coverage and want to target the varicose and spider veins themselves, these would be a good option. The stockings come fitted for individuals with less muscle tone or fat in their calf and thighs. It is vital for you to size correctly with these stockings to make sure you don’t find yourself having to pull them up all the time. They still come in a 20-30 mmHg gradient compression range which will support and apply enough pressure to promote blood flow to combat swollen and bulging veins. Here’s another compression stocking with a different and unique design. These manufacturers designed their socks with an open-toe design. You may be asking yourself: why? The benefit of an open-toe stocking is that it promotes increased breathability and air circulation compared to a regular compression stocking. It allows for additional comfort for during long-term passive wear. You get all the benefits of regular compression stockings, with a little more comfort from the high-quality nylon/lycra material which makes for a soft feel against the skin. It is also in the 20-30 mmHg gradient compression range for a firm direct pressure to help alleviate mild to moderate levels of compression. If you’re looking for something a little different, this pair of compressions stockings might be able to fulfill that purpose. These compression stockings are the best for men. Each pair is specially designed to come in a sleek, low-profile black color and ample thigh-high coverage. You can comfortably wear these under a pair of pants, jeans, or shorts when you’re at home or when you go out for work. All you have to do is wear it. And the compression process will undergo itself. The graduated compression in these stockings is in the 20-30 mmHg range to help deal with mild to moderate levels of varicose veins. It’s a comfortable pressure that doesn’t feel constricting on the skin. You can wear these for an extended period. There is an elastic band at the end of the stockings that will ensure the socks stay on for the duration of your wear, so you don’t have to think about having to pull these up all day. Just make sure you’re getting the right size. For my guys out there, if you need another option in compression stockings, TruForm is a well-known brand in the industry that will have your back. 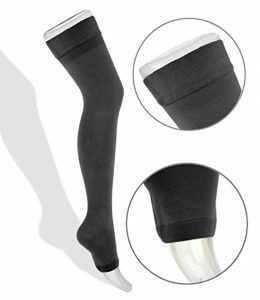 Their compression stockings are high-quality and well-made with nylon/spandex material. These are one of the options that doctors and other medical practitioners recommend their patients when they want to combat the bulging and swelling of varicose veins. Each stocking is designed to support you. With reinforced toes and soft materials, the sock doesn’t feel constricting on the skin as it applies compression. You’re getting a durable well-fitted compression stocking. As always, make sure you get the right size for you. BriteLeafs offers a compression stocking in a pantyhose variant for those individuals who want full coverage compression and support. Full lower-body compression to deal with all the soreness or swelling that happens throughout your legs and a style choice with medical benefits. You’re getting both form and functionality in one with this pantyhose. It features a 3-D designed with reinforced areas of the feet such as the toe and heel for additional support to prevent further soreness or injury. It also comes in a 20-30 mmHg graduated compression range to help alleviate some of the symptoms of most varicose and spider veins. An overall excellent choice for best compression stocking for women everywhere. If you’ve seen some of the items on this list, you’ll know that compression stockings can come in all shapes and sizes. And it’s no different for these compression stockings and tights combo by TherafirmLight. If someone else saw you wearing these, they would think they’re just regular tights. But the kicker is that they are also stockings with medical benefits. You can take advantage of the 10-15 mmHg graduated compression to help deal with smaller cases of varicose veins and spider veins. You’ll get to take advantage of having a pair of stockings that look good and have medical benefits. These are one of the more comfortable compression stockings on the list. So you can trust these to have a relaxed fit when you’re wearing them at home or when going out. And while you’re wearing it, the compression process is helping deal with your swelling and soreness. These knee-high compression socks by EvoNation feature a minimalistic, sheer design if you prefer something a little smaller than tights, but not necessarily a compression sock. The sheer fabric provides maximum comfort for the wearer to allow for wear throughout the day. By having a sock that encourages people to wear for extended periods of time, it enables individuals to take advantage of the 15-20 mmHg graduated compression to help with varicose veins and spider veins that may develop in the calf area. The sheer look is something that you may want when putting together an outfit for fashion/style purposes. You’ll be able to get compression benefits while looking your best. Double check sizing charts and measurements for each manufacturer. It’s a horrible feeling to get your compression stockings in the mail, and it doesn’t fit. A well-fitted compression stocking compresses better than an ill-fitting one, making varicose and spider vein treatment more effective. Read our other buying guides to check out any other compression gear.